« Cultural References in Fashion: Reverent or Racist? The Met Gala: What were they thinking? We promised to cover the Met Gala red carpet, to see who slayed it and who missed the mark. Silly us, worried about cultural missteps. We should have been concerned with fashion faux pas. Tassels and headresses and glitz, oh my! How do you say ” Oy vey” in Mandarin? Sarah Jessica Parker stepped out in a fringed headress from milliner Phillip Treacy and a custom H&M gown which she collaborated on. Speechless. They don’t call it the “Vogue Prom” for nothing. Anna Wintour, whose name is now on the door of the Costume Institute, greets her disciples in Chanel. As they remind us often in fitness classes; take your shoulders out of your ears and relax, Anna! Tabitha Simmons donned a headress too, by Dolce and Gabbana. The Folies Bergere wants it back in the morning. Is that JLaw, or JLo? Not flatterning, whoever you are! ( I know others strongly disagree!) in Dior. What’s with the head coverings? Anne Hathaway lost her way in this number, by the big bad wolf by Ralph Lauren. Momager Kris Jenner was a lady in red by Balmain. Solange, Solange, Solange: in Giles Deacon. What’s on your head Selena Gomez? I know it’s Vera Wang, but was the bridal headpiece really necessary? 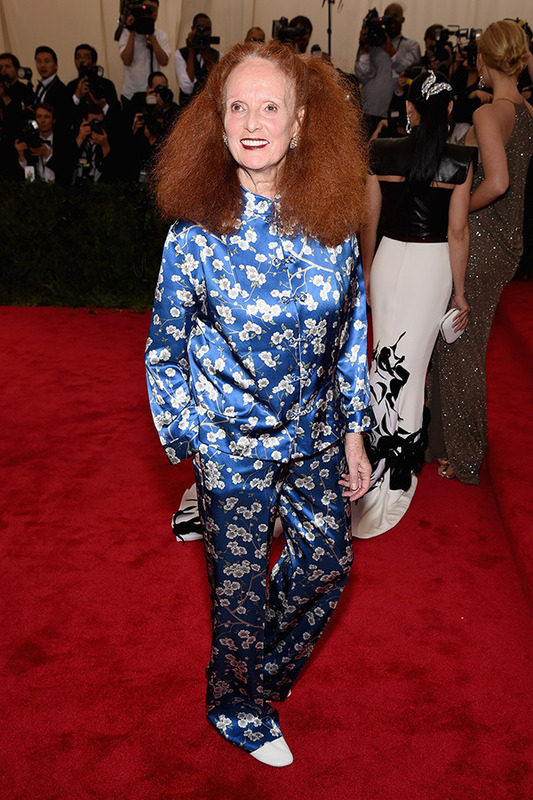 Vogue’s Grace Coddington anticipated a late night and showed up in her pajamas. 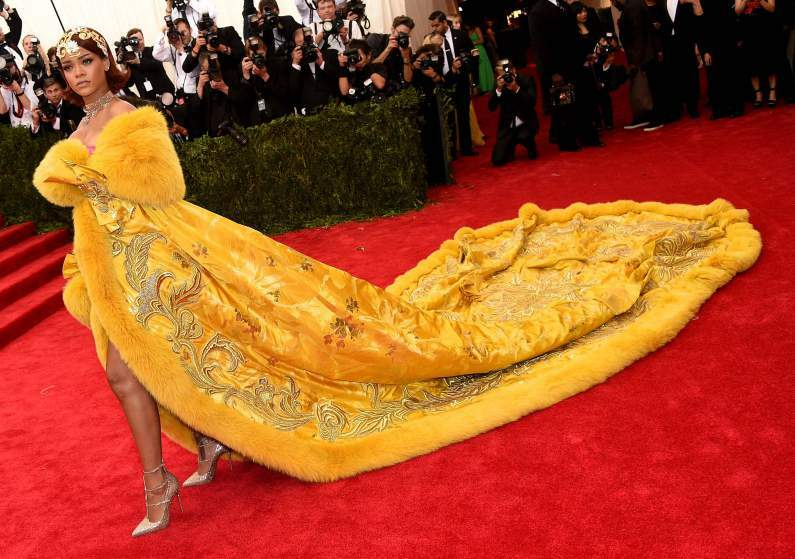 Riri knows how to make an entrance in Chinese designer Guo Pei. Kim Kardashian is nearly naked in her custom Roberto Cavalli gown. Suprise, Surprise! How low can you go JLo? in Atelier Versace. The woman that can do no wrong…Amal Clooney in John Galliano. Kate Hudson goes for the gold in Michael Kors. Dianna Agron’s Tory Burch dress featured birds of a feather. This entry was posted on May 5, 2015 at 6:35 am and is filed under fashion. You can follow any responses to this entry through the RSS 2.0 feed. You can leave a response, or trackback from your own site.